Have you always wanted to be able to put on your makeup without a struggle? 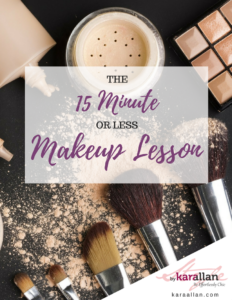 Do you have less than 15 minutes in your daily schedule to get your face together? Well, today is your lucky day. I spent years working for MAC (Makeup Art Cosmetics) and Christian Dior and teaching women how to properly apply makeup especially when they have no time in their already busy schedule. Enter the Holy Grail of Makeup Lessons. You can gorgeous in 15 minutes or less. This is the equivalent of having a professional makeup artist sit with you and teach you step by step how to get glamorous. Get yours today for only $19.99. It’s the best $20 you ever spent. Trust me! Click the picture below to get your today!